In the English Championships, the 17-year-old took both the U20 and senior high jump titles with a clearance of 1.74m in very challenging, wet and windy conditions. Emily now has four championship titles to her name in 2018, to go with her third place in the U20 British Heptathlon Championships earlier in the season. This latest win has gained her selection for the senior England Team at the Manchester International meeting on 15th August. 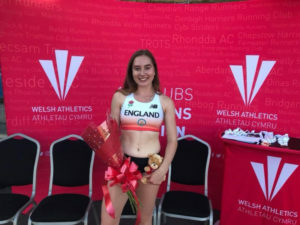 It also rounds off a very busy week because just four days earlier, competing for the England U20 team, Race was victorious at the Welsh international match in Swansea, setting a new stadium record of 1.73m on her way to yet another high jump victory. In what has already been a very congested, but successful season for the multi-talented athlete, in her first year as an U20 competitor, Emily will follow up her forthcoming international event with the English Schools Heptathlon Championships in early September, before taking a short well-earned break.